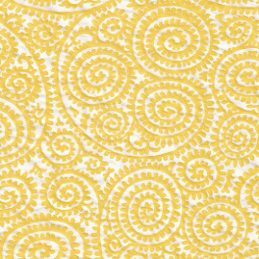 Learn how to make pretty patterned eggs from paper. 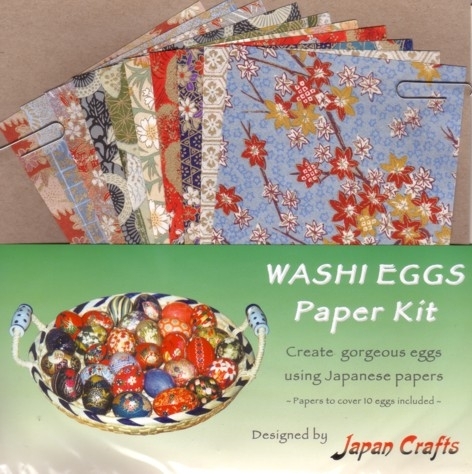 This Kit will teach you how to create gorgeous paper covered decorated eggs from our beautiful range of chiyogami yuzen papers. 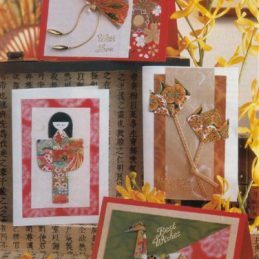 The term “Washi eggs” has evolved from the Japanese word “Washi” meaning handmade paper. 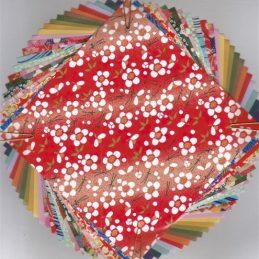 These papers are naturally strong and pliable making them specially suited to this technique where the paper is wrapped around the egg’s surface. 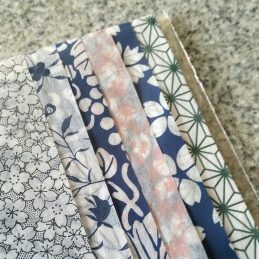 Reasonably simple to make, washi eggs are a lot of fun to do on your own or in a group. 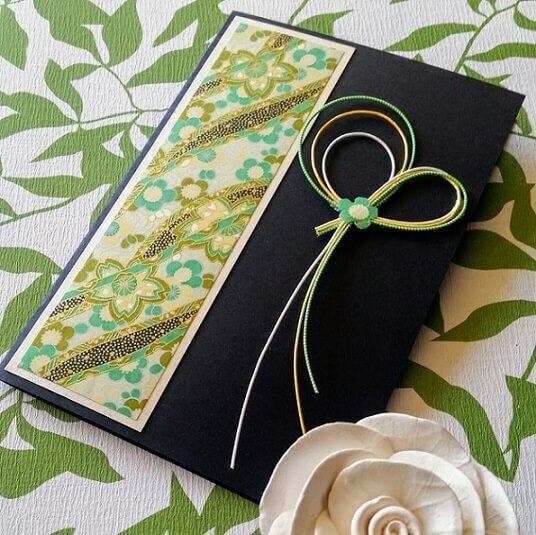 Each Kit includes an assortment of 10 sheets of chiyogami yuzen papers in a variety of colour hues. The process of measuring, cutting and applying the paper to the egg is set out in our step by step instructions. 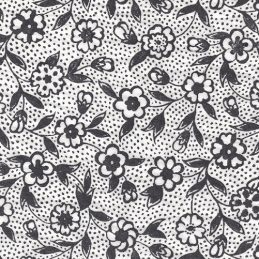 The intricate patterns surprisingly appear almost seamless once the paper has been pasted down. The eggs can be finished with several coats of varnish. 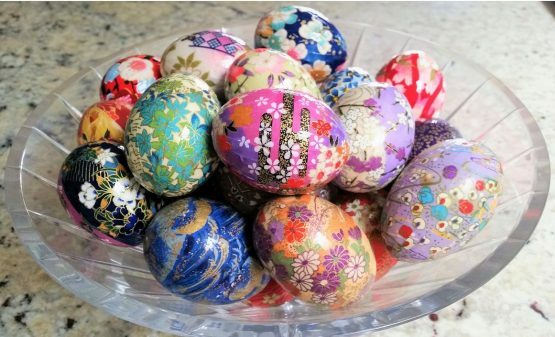 As well as making wonderful Easter ornaments, washi eggs are perfect as Christmas decorations by easily adding a hanging loop to the top of the egg. They make ideal gifts and can be displayed in a bowl or vase to show off all year round. They are also better for the waistline than the chocolate varieties we see at Easter time. This would be a fun activity for kids, even teenagers, and people who love crafts and like working with their hands. The Kit caters for chicken sized eggs but once you know how you can adapt the technique to any sized egg. The eggs are not included. However, the Kit has instructions for blowing out hen’s eggs or alternatively use papier-mache or wooden eggs available at craft and variety stores. Additional materials like scissors, pencil, ruler, paste, teaspoon, paintbrush and varnish will be required. Splendid selection and easy to use. Very happy with this kit. I did appreciate your assistance and the prompt despatch of the kits. Thank you. I look forward to being in touch again in the future. Prompt delivery was lovely, and I can’t wait to give the eggs a go. 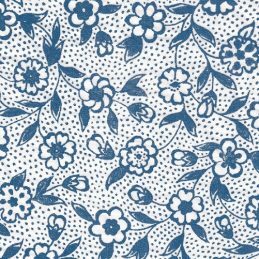 Being an artist I can appreciate the gorgeous patterns and designs.